The kidneys are a pair of vital organs that perform many functions to keep the blood clean and chemically balanced . The kidneys are bean-shaped organs, each about the size of a fist. They are located near the middle of the back, just below the rib cage, one on each side of the spine. The kidneys are sophisticated reprocessing machines. Every day, a person’s kidneys process about 200 quarts of blood to sift out about 2 quarts of waste products and extra water. 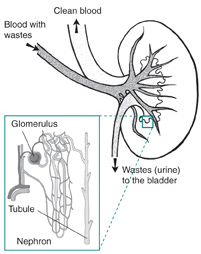 The wastes and extra water become urine, which flows to the bladder through tubes called ureters. The bladder stores urine until releasing it through urination. The kidneys remove wastes and water from the blood to form urine. 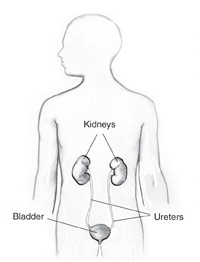 Urine flows from the kidneys to the bladder through the ureters. Wastes in the blood come from the normal breakdown of active tissues, such as muscles, and from food. The body uses food for energy and self-repairs. After the body has taken what it needs from food, wastes are sent to the blood. If the kidneys did not remove them, these wastes would build up in the blood and damage the body. In the nephron (left), tiny blood vessels intertwine with urine-collecting tubes. Each kidney contains about 1 million nephrons. Calcitriol, the active form of vitamin D, which helps maintain calcium for bones and for normal chemical balance in the body. The word “renal” refers to the kidneys. The terms “renal function” and “kidney function” mean the same thing. Health professionals use the term “renal function” to talk about how efficiently the kidneys filter blood. People with two healthy kidneys have 100 percent of their kidney function. Small or mild declines in kidney function-as much as 30 to 40 percent-would rarely be noticeable. Kidney function is now calculated using a blood sample and a formula to find the estimated glomerular filtration rate (eGFR). The eGFR corresponds to the percent of kidney function available. The section “What medical tests detect kidney disease?” contains more details about the eGFR. For many people with reduced kidney function, a kidney disease is also present and will get worse. 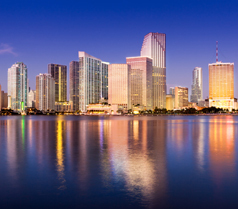 Serious health problems occur when people have less than 25 percent of their kidney function. When kidney function drops below 10 to 15 percent, a person needs some form of renal replacement therapy—either blood-cleansing treatments called dialysis or a kidney transplant-to sustain life.